Our congregational roots reach to the 1940s to a small group of families in Painesville, Ohio. By the 1960s, these families formally devoted themselves to establishing a permanent, fully-functioning congregation. According to the group’s first President, Dr. Ronald Posner, “the idea [to found a Temple] started over a bridge table,” and the greater religious and social community grew from there. During the 1970s, with a dramatic growth of business in Mentor, young families moving east from the Cleveland area for land and work rejuvenated and grew that founding congregation. At that time, membership was comprised of 35 family units. High Holy Days services were first held in 1971 at Lake Erie College. Sunday and Hebrew School classes met after-hours at local public schools, and Shabbat services rotated among member homes and a succession of welcoming local churches, primarily the East Shore Unitarian Universalist Church in Kirtland, Ohio. Our gratitude to these welcoming institutional neighbors is deep. The building at 7599 Center Street that now houses our Temple was first erected as a house of worship for St. Mary Catholic church in the mid-1800s. Mentor Church of God was the next spiritual resident of the building. In 1987, with the financial assistance of the Painesville Jewish Center, we purchased the building, renamed it Temple Am Shalom, and joyfully carried the Torah to our waiting ark. Temple Am Shalom remains the sole synagogue serving Lake County, Ohio. Mentor is the heart of our population, but our members also come from nearby cities such as Concord, Kirtland, and Willoughby. Many others who appreciate Am Shalom’s informal atmosphere and close-knit community join us from all over the greater Cleveland area, including from Cuyahoga, Geauga, and Ashtabula counties. Temple Am Shalom’s spiritual leadership and congregation are committed to learning, serving, and embodying the ideals and practices of Reform Judaism. The Temple provides Shabbat services, life-cycle and ritual observances, and holiday celebrations. We endeavor to know and understand the Torah in ways that empower us to recognize the presence of God in our lives and the excellence of Judaism as our conduit for serving God, each other, our communities, and our world. Because we are the only Temple serving Lake County, we are dedicated to sustaining and growing the local observant Jewish population. Each congregant is aware of our potential roles in strengthening and building the Temple’s presence, both within our own lives and throughout the larger communities in which we live and work. We are also aware of recent losses of smaller congregations in our surrounding communities, and warmly invite those who have lost their beloved congregations to join us in sustaining the Jewish presence in Lake and surrounding counties. We worship together as a community in order to understand our responsibilities to God, to our faith, and to each other in equal measure. Our spiritual leadership promotes a spoken liturgy and lived faith that addresses everyday challenges that we face not alone as Jews, but also as fellow humans in a diverse and complex world. Temple Am Shalom strives to be a positive presence in the world, adhering to the practices of torah (lifelong study of the word of God), avodah (worship of God through prayer and observance), and gemilut chasadim (acts of peace and loving-kindness). We do what we can to actively support movements that promote local, national, and global social justice. We actively encourage tzedakah: to give to the poor, the disenfranchised, and the oppressed here in our midst and around the world, without regard for faith or nation or race. We embrace the ideal of tikkun olam, the healing of the world through our faith, our words, and our actions. We worship and celebrate together in an informal atmosphere. Among our congregants are raised Jews, converted Jews, Christian partners, and spiritual seekers. We warmly welcome all who are interested in Judaism into our Temple, and encourage open discussion and exploration of our faith, our worship, and our practice. Renee Berenson Blau (née Cohen) serves many functions at Temple Am Shalom. She is primary lay spiritual leader, lead Cantor, and Co-Education Director. Renee has been singing as long as she can remember, from elementary school to high school. During her junior year at Kent State University (KSU), she spent 6 months in Israel. While there, she joined a group of American students from Tel Aviv University whose highlight was singing for troops stationed in Sinai during Israel’s Yom Ha’atzmaut 25th anniversary celebration. Following her graduation from KSU, Renee employed her teaching and cantorial talents at various congregations throughout the Cleveland area. She taught music at Park Synagogue for the special education classes, and at Temple Am Shalom before we even had a building to call our own. Renee has been a cantorial soloist for the past 20 years, working not only at Temple Am Shalom but also at Temple Beth Shalom in Hudson (under Rabbi Susan Stone). She has had the pleasure over the years of working as cantorial soloist under Cantor David Wolinsky, the late cantorial soloist May Jane Lobel, Rabbi Alan Lettofsky, Rabbi Norman Roman, and the late Rabbi Philip Horowitz. Her skills as a classroom teacher and Jewish educator over the past 28 years have been evident in her participation in Judaic studies, Hebrew language classes, and Bar and Bat Mitzvah lessons at the former Brith Emeth Congregation, Park Synagogue, Congregation Anshe Chesed, Congregation Bethaynu, and Temple Israel-Ner Tamid. Renee’s devotion to raising her two children with a Jewish education led her to Temple Am Shalom nearly 20 years ago — Jeff and Rebecca both had their B’nai Mitzvot at Am Shalom — and she has never left us. Renee has retired from her teaching position with the Cleveland Metropolitan School District. Her plans for the future include spending more time with her grandchildren, her children, her spouse, and her congregation. Elise Aitken serves as Temple Am Shalom’s co-Spiritual Director, assistant Cantor, and leader of the Youth Group. Over the years, she has held (and continues to hold) many important positions within the congregation, including Youth Group advisor, Ritual Committee supervisor, Shabbaton Director, and Adult Education Chair. She co-leads High Holy Day services, and regularly leads Shabbat and festival services. Elise often incorporates music into the services she leads, and has led Kol Nidrei with her father, a professional tenor. Her knowledge of Jewish liturgy, history, and culture is substantial, and her ability to make Judaism immediately relevant, meaningful, and manageable to her audience is invaluable. 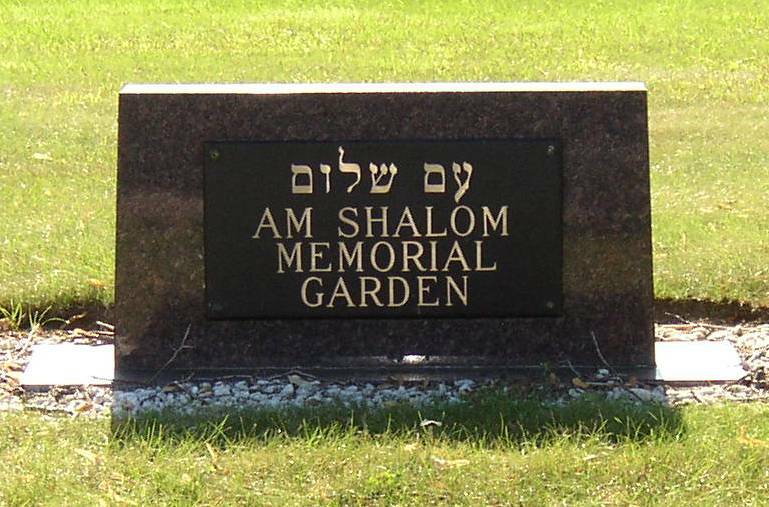 The Am Shalom Memorial Garden is a dedicated cemetery located within Western Reserve Memorial Gardens (WRMG) in Chesterland, Ohio. Our cemetery is a consecrated section, set apart from other faiths and immediately adjacent to another dedicated Jewish cemetery. The plots are located at the front of WRMG on a lovely grassy field. A flat headstone marker is a required feature, leaving the field open and serene. We offer Am Shalom cemetery plots to members and non-members alike. In keeping with Temple Am Shalom’s embrace of mixed-faith families, plots are available to non-Jewish people with immediate family members who are Jewish. Cemetery plot rights may be purchased, and location selected, during advance planning or at the time of need. Families can complete the plot purchase directly through a Temple Am Shalom coordinator, or may have a funeral home assist with this. To review our pricing and policies, or to inquire about available plots, contact us at tasmentor@gmail.com or call 440.255.1544. The Temple also offers Memorial Plaques. Located inside the Temple’s foyer, our Memorial Board serves as remembrance and commemoration of Am Shalom congregants who have died. All who wish to create a permanent remembrance for a loved one within Temple walls may do so. The Memorial Board at Temple Am Shalom has four (4) spaces left. Memorial plaques are available for $225 each. For more information or to purchase a plaque, contact us at tasmentor@gmail.com or call the Temple at 440.255-1544.